Leadership is a very individual thing, and we make suggestions only because there are small coastal communities which have never yet had a kayak club. We would love to hear your top tips for successful leadership, club organization and setting up community programs. Ideally a club has a core of competent people who are happy to take it in turns to act as leader and assistant, keeping their eyes open for things which need doing and doing them without being asked. A program of interesting trips (perhaps one trip every two weeks) is great but is it enough to keep a club alive and well? A club always has some turnover of members and it's good to get a steady trickle of new members. Some will be there for the kayaking and some mainly for the social side. A club barbecue, fundraiser or a visit to a kayaking exhibition may do more to strengthen a club than three or four trips on the water. A structured training program is a great way to keep kayakers interested and to bring on new assistants and leaders. For example, the BCU's Star scheme for personal skills and group leadership, and the BCU coaching scheme for those who provide training. Club members may also be willing to pay for courses in First Aid, navigation, lifesaving, marine wildlife and so on. If the club doesn't have instructors or coaches who are qualified to assess people for kayaking qualifications, a possible solution is to to pay a freelance coach to visit every six weeks. To survive, a club needs a minimum number of members. In a remote village where there isn't much else to do, six may be enough. In most places you probably need a minimum of fifty members, of whom twenty turn up for club activities at least once a month and five are happy to help run the club and its trips. In a cool climate, not many people go kayaking all year round so if the club has access to an indoor swimming pool for winter training the committee won't have to re-start the club every year. One way to encourage people to join is to have a few kayaks which new members can rent. If you want ten sea kayaks it can be very cost-effective to get a mold and build them in fiberglass. See Build Your Own Kayak In Fiber-Reinforced Plastic. Kayak stores may offer a 12.5% discount for bulk purchases of kayaks, clothing and other equipment. If you are going for a trip a long way away and some participants are getting a ride in another participant's vehicle, probably it is fair for them to pay something to their driver. Should this just be a share of the cost of fuel? If you include the expense on oil, servicing and maintenance the real cost to the driver is about twice the cost of the fuel. We don't think organising a trip should cost the leader money on telephone, postage, photocopying, equipment, fuel, or food and drink for other people. If members are supposed to make a contribution towards expenses or club funds, it's good to have one person as treasurer. Getting money out of people is a skill you can't teach. It seems to help if the treasurer has a clipboard so they can write everybody's names down as they arrive. If there are children in the group you really need safety rules. With a group of adults, diplomacy is maybe more important than strict rules. Is the proposed trip well within your personal ability, so that you will have confidence and energy to spare if one of the group capsizes or needs a tow? If you invite somebody to go on a kayak trip which you are leading, they probably expect you to have appropriate training, experience, support from assistants, and equipment. In some countries a leader is legally required to have appropriate qualifications. Whether legally required or not, leadership or coaching qualifications are a useful indicator of the skills you need before you can reasonably take a group to sea. The BCU 4 Star Leader award for sea kayaking is for those capable of leading a group of up to four other kayakers on a three-hour trip in a moderate tidal water environment. That means "a stretch of coastline or estuary in close proximity to the shore... up to a maximum of 2 knots tide but...[no] tidal races or overfalls". The assessment takes place on a "coastline with available landings at least every 1-2 miles... and areas where it is not easy to land". Launching and landing must take place through small surf, which means waves less than 1 meter (39 inches) high and without beach hazards such as rocks or groynes. The candidate will be required to demonstrate his/her personal skills in "force 4/5 winds, sea state 4". (S)he must have attended a course on coastal navigation and if carrying a VHF radio (s)he must have the relevant qualification. (S)he must be capable of paddling 15-20 miles a day in the sort of conditions appropriate to a 3 Star assessment. What equipment will you need? See Equipment Checklists. In some countries it is a criminal offense to set off without carrying certain safety equipment, to go more than a certain distance away from the shore in a kayak, or to lead a trip without having certain qualifications (particularly if people are paying to go on it). In many countries there are rules about kayaking with children in the absence of their parents. You may need a certificate showing you have no criminal record. If you have liability insurance, perhaps because you are a qualified instructor, is it a condition of the insurance policy that you must take certain precautions, or restrict your trip to certain areas? Do you need insurance to cover the cost of a rescue if things go wrong? The cost of a search-and-rescue operation by lifeboat or helicopter can be anything from $1,000 -$30,000 per person. In some countries these services are provided free by volunteers or the armed forces and are free, in others they are provided by contractors and survivors are legally required to pay the cost of the rescue. Perhaps the single most important question. Until you have seen all your group in action, we suggest you assume (whatever they told you on the phone) that they cannot reliably roll their kayaks, or carry out a tow or deep-water rescue. Unless you are sure that everybody in the group can reliably roll, tow and rescue, you will need the support of at least one "safety kayaker" who does have those skills and equipment. If one of you is carrying out a rescue the other can shepherd the rest of the group. This is particularly important with groups of young people because as soon as your back is turned, probably some are getting anxious and others are horsing around. For a mixed-ability group going outside sheltered waters it will seldom be enough to have one expert leader and one competent safety kayaker. A few trips will require one expert for every intermediate kayaker. Is it the right time of year? Well-equipped experts can enjoy a surf trip in the middle of winter. In a cool climate, six months of the year are best left to them. The other half of the year is good for intermediate kayakers, with a reminder that spring sea temperatures are only a few degrees higher than in mid-winter so maybe they should wear clothing for winter. For beginners in a cool climate, sea trips are probably best left until the latter half of summer. 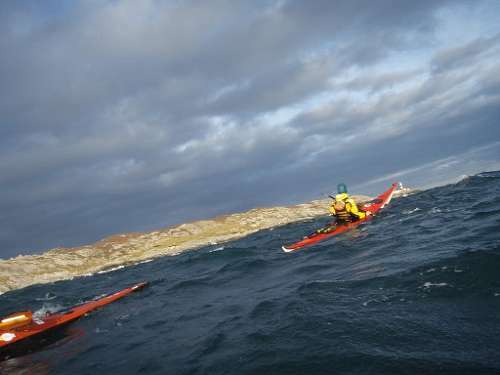 Ideally, don't lead a group of mixed-ability kayakers along a particular section of coast until you have already explored it yourself in similar conditions. Probably the most important issues are the extent to which the coast is exposed to the open ocean, and the distance you will be going from a harbor, beach or other safe shelter. Exposed coast. An exposed section of coastline is one which is strongly affected by wind and waves coming directly from the ocean. If the prevailing wind (blue arrow) blows across a wide expanse of open ocean, there may at any time be oceanic groundswell surging over reefs and into caves. In windy conditions there will probably be a heavy surf on the beaches and waves exploding on the cliffs to send spray high into the air. Wind, waves and tidal currents are always strongest at a headland. Lands End in Cornwall projects far out into the Atlantic and is exposed to oceanic wind and waves over 100 degrees of the circle. There is nothing closer than America to break the prevailing wind and the Isles of Scilly do little to break up the swell created by mid-Atlantic storms. There is usually quite big surf at Sennen Cove, which is the beach next to Lands End. When a big swell is running, one wave bigger than the rest can unexpectedly touch bottom on submerged rocks and break even in quite deep water. In addition, there is a high tidal range in the Lands End area, which means strong tidal streams. Even in the open sea, the tide regularly creates currents of 2.6 knots. 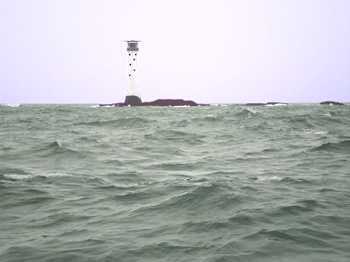 There is a tide race, usually benign but often very fast, just off Lands End. This is not a sensible place to take a group of beginners, and it is suitable for intermediate kayakers only if you have the right combination of good weather and moderate tides. This is the only confessional your editor is putting on this site, so enjoy it! Many years ago he was kayak-surfing at Sennen Cove in a Dancer. It was a nice summer day with light winds and a fairly calm sea. He decided to go for a little trip out to the Longships lighthouse, which was clearly visible and only about 30 minutes away by kayak. He had barely glanced at the chart and had no current atlas. With hindsight, this was a really dumb thing to do on a highly exposed coast, but he was young and inexperienced. He and a friend went south through a cave under Lands End and then out towards the Longships reef, which is only about 2 nautical miles offshore. On the way over, they did at least take the precaution of checking their position with occasional ranges. This showed they were heading quite fast for South America and were likely to miss the Longships altogether. That seemed a good moment to turn round and head back to the beach. They were still about 0.7 miles offshore in what appeared to be deep water. No other wave had broken there in the previous 15 minutes. A wave suddenly peaked up to 10 feet high, nearly close enough to touch. Your editor found himself looking along the barrel of a tubing wave which Hawaii would have been happy to claim for its own. It could have ripped them out of their boats and caused serious damage and injury. When they re-checked the chart afterwards they found they had been in the area of an isolated reef called the Kettle's Bottom. There was another nearby called the Sharks Fin. Having survived that, as they got closer to Lands End they could see that the tide race was in full flow round the headland. Because there was no wind, the water in the race was fast but smooth, apart from great big whaleback waves which were not breaking. The problem was that it was flowing the wrong way at about 4 knots. They thought "no problem, we can go back through the cave. It has at least 12 feet of headroom". Just as they were about to enter the cave, a big wave filled it up to the roof. The safe thing to do would have been to wait in the shelter of the headland for a few hours until slack water. For various reasons such as having no food and not having a radio to tell friends on shore not to call the emergency services, they decided to carry on. That meant a very scary fifteen minutes going the wrong way round the outer edge of the tide race. Friends rock-climbing on the nearby cliffs said it was quite remarkable to see two tiny dots of color against the oily black waves of the race, making no perceptible progress. Sennen Cove and the Longships are so attractive but so exposed that they have been the scene of many tales of terror. For another one, click here. Sheltered coast. A section of coastline is sheltered if it faces away from the ocean or is behind a long reef or a line of islands. The most sheltered coastal waters of all are narrow inlets which penetrate far inland, especially if they have deep water and steep sides covered in trees. Some of the best examples are river valleys which were flooded by the sea long ago when the level of the land went down. For example, the estuaries of south Devon and Cornwall, the abers of Brittany (Bretagne) and the rias of Galicia. Fjords cut by glaciers and then filled by the sea may be sheltered, but on a windy day things may get rough because a valley with steep or vertical sides will funnel wind and may increase its speed and turbulence. See The Effect Of Landscape. Are beaches always safe? Most sand or sand-and-mud beaches provide a guaranteed safe exit but in some places and at some times the exit may not be dignified or comfortable! The BCU 4-star syllabus talks of "available landings at least every 1-2 miles". If the coastline consists of continuous cliffs with only the occasional wave-cut bench (which looks like a beach but is carved out of the solid rock) there is nowhere to stop if something goes wrong. Such a coast is said to be "committing". It is always difficult to get out of a kayak onto a rock or boulder beach without some sort of injury or damage. When waves are breaking on it, it is best not to try. We have seen it suggested in sea kayaking books that you can land on a rocky coast by letting a wave wash you up onto a rock ledge and leave you there high and dry. They called it a seal landing but in our experience it may end like this picture. The attempt calls for a very battered polyethylene boat, heavy duty paddle, helmet with face guard, leather gloves, elbow protectors. Most coasts do have quite frequent sand or gravel beaches, at least at low tide. Sandy beaches usually have a shallow gradient and gentle waves. Along any coast famous for its surf the sheer size of breaking waves can be a problem for sea kayakers who will find that about half the sandy beaches are regularly "closed out" by big surf breaking all the way along the beach. That generally happens in windy weather but can happen on a calm sunny day. Again, it depends on the extent to which the particular beach is exposed to the ocean swell. For those occasions when you've got more surf than you want, see Getting Back To The Beach. Beaches made of coarser material such as large gravel, shingle or cobbles are often steep, especially after they have been banked up by a storm. Waves landing on a steep beach often dump their energy violently. Launching or landing there is often uncomfortable when a strong wind has been blowing onshore for some time. A few shingle or cobble beaches are too steep even for dumper waves so they get surging waves instead. These don't really break, but rush up the beach with enough power to knock over anybody standing in the shallows, and then rush straight back down, towing a victim seawards in their backwash or undertow. Any beach with a steep profile will be difficult or dangerous during strong onshore winds. Avoid. While we're thinking about beach conditions that may sometimes be too rough for an easy landing, there are also a few beaches that are too soft. See Mud & Quicksand. Anybody can walk or kayak a few miles. A fit person can easily walk 10 miles or paddle a classic sea kayak 15 miles in good conditions. If you are on a mission you can walk 25 miles or kayak 40 miles, although you may not be much use at work the next day. For trips by experienced adults in classic sea kayaks, a round trip totalling 12-15 miles (20-25 km) is a good total length to start with. If you have to mix sea kayaks and short boats on the same trip, make it 6 - 9 miles (10-15 km). It may be OK to finish an advanced trip for adults with everybody exhausted, but if there are children in the group it is probably best if, at the end of the trip, they feel they could go straight out and do it again. 5 miles (8 km) may be good. It's fun to go for the occasional trip as part of a fleet of forty sea kayaks, maybe on New Years Day, but it frightens the living daylights out of the wildlife and tends to end up spread over three or four miles of sea. If anybody in the group needs to stop or land because of cramp, cold or to take a photo, it will probably not be possible to achieve full communication and agreement. In milspeak you have order, counter-order and disorder. If you have enough leaders, safety equipment and navigation equipment to go round, consider splitting a big outing into groups of six to eight kayaks and sending them on different routes. Risk assessment is an essential concept for kayak coaches and guides and worthwhile for club leaders. Kayaking is an adventure sport and kayakers voluntarily take risks. Even in a workplace, the purpose of risk assessment is not to eliminate all risk but to think about the hazards of a particular activity and decide what is acceptable. Low risks can often be disregarded. If you realize there is a moderate risk which could be eliminated without too much trouble or money, you may decide to do so. If a leader decides not to eliminate that risk, should (s)he discuss it with the group? If you realize there is a high risk, you may decide to relocate or cancel the activity until circumstances are more favorable, for example when the weather is better or you have one or two more experienced kayakers in the group. 3. Evaluate the risks and decide whether existing precautions are adequate or more should be done. 5. Revise the assessment if circumstances change." Risk assessment is about avoiding unnecessary pain, injury, expense and damage, not about creating paperwork. An experienced leader may be justified in carrying out a dynamic risk assessment, which means using a mental checklist rather than a paper one. Things don't often go wrong with a sea kayak trip, but in case they do it can be useful to get into the habit of using a paper checklist for each trip and keeping them in an archive folder. Arguably, a risk assessment should concentrate on the situations which actually do cause a lot of significant injuries. Kayakers seldom get injured at sea. The dangerous places are on the road, in the car park and on the beach. If a situation is very unlikely to arise you need not waste time thinking about it unless the consequences would be very serious. A risk assessment must assess the particular activity. A professional who is leading a trip from A to B in mid-winter will not rely on an assessment made of the risks of doing the same trip in mid-summer. Reassessment is essential. One repeatable way of doing this is with a risk assessment matrix, such as the one proposed by Eric Soares and Michael Powers in Extreme Sea Kayaking (TAB Books, 1999). Their MAGS formula or method for approximately grading the sea produces a score based on water temperature, wind speed, wave height, swim distance to safety, presence of breaking waves, whether you intend to do rockhopping or enter sea caves, and whether there is to be any paddling in fog or at night. A risk assessment must also take account of the individuals who are going to do the activity. Let's say you have assessed a trip as "low risk" for you and your whitewater friends. It may be medium or high risk if you have a mixed-ability group, some of whom are not very strong, experienced or well-equipped and one of whom suffers from asthma. A risk assessment should take account of likely problems, but it can't take account of every possible situation. It is quite likely that somebody in the group will break or lose a paddle. This would be a moderate risk and the solution is to carry a spare one. It is less likely that one of the group will slip on seaweed and break a wrist or collarbone, but we would say this is still sufficiently likely to come within a professional risk assessment. The solution is to minimize landings where the only route on foot is over seaweed-covered boulders and have a competent First Aider, a First Aid kit, a way to call for help and at least one tow-belt. See Leave No Trace Ethics. If the group includes inexperienced kayakers, tell them how many hours of paddling they can expect and whether certain equipment is compulsory for the trip - such as a true sea kayak with watertight hatch covers and additional flotation, a reliable sprayskirt, a waterproof jacket, a PFD, waterproof jacket, maybe a wetsuit, maybe a helmet, maybe lunch and a drink. Ask the experienced kayakers to bring a tow belt or some other towing system. If appropriate, ask them to bring along any VHF radio or flares they may have. You may need to provide some group equipment yourself. See below. In terms of navigation, if you're going for a three hour round-trip in sheltered waters with experienced friends, maybe you just need a road map. Otherwise as trip organizer you need full navigation skills. See Sea Kayak Navigation. Consider where you will run to, and how you will get help, if your group has a medical, equipment or weather emergency. The "health & safety" approach says you should always carry enough equipment to cope with any emergency, such as a bad fracture combined with hypothermia. Another view is that this makes kayaking expensive and tiring and may even cause an accident. See Travelling Light. On an advanced trip everybody in the group should have a tow-line. The group will also need at least one spare paddle, First Aid kit, repair kit, portable pump, chart extract, set of tide tables, current atlas, compass and VHF radio or other ways of getting help. In general see Equipment Checklists. It's good if everybody has a chart extract, etc, partly because a sea kayaking group may split up for good reason or bad, partly so everybody feels they're actively involved. Apparently a candidate for a BCU 4 Star Leader award is now expected to have both a plastic survival bag and a group shelter, and this is certainly an excellent idea for anybody leading a longer trip in cold, windy weather. This is just a large plastic bag in which a hypothermia victim can be placed with a friend until he warms up or is evacuated by helicopter or lifeboat. Made of thick (500 gauge) orange polyethylene, they are usually about 8 feet long by 4 feet wide. A plastic survival bag stops wind and rain from taking the casualty's body heat. Crucially, because it is made of plain ordinary plastic and not a breathable fabric it also prevents cooling by evaporation of moisture from the casualty's skin and clothes. Breathable fabrics allow heat to pass through, along with water vapor. Current thinking is that in cool climates there is no particular advantage to having a "space blanket" with a silver metallised reflective coating, or a survival bag with a reflective coating, but it can't hurt. Peter of Lekko Kayak Club in the Netherlands recounts a joint experiment with instructors from Zeekajak.nl and the Coastguard which showed that a kayaker in a metallised space blanket is also more visible on radar. If you are unlucky enough to be floating in the sea and hoping for rescue, you can reduce your heat loss by climbing into your survival bag and pulling it up round your neck. That way you are warming up the water in the bag, but not the entire ocean. Alternatively you can make yourself much more visible by inflating your orange survival bag and holding the neck underwater. It will make an orange buoy more than 6 feet high. A group shelter may be called a bothy, igloo or KISU (after the old Karrimor Instructor Survival Unit). You can get your group inside it to keep warm during cold, windy winter lunch breaks. It is a large bag of lightweight waterproof fabric. To use it, everybody sits in one place, feet together, and you throw the group shelter over all. Everybody then pulls part of the edge under him or her and sits on it. With miraculous speed, body heat and breath create a warm space. You can easily make your own. It need not have straight waterproof seams, but it must be as small and light as possible. It must at least be windproof. If it is to make an effective survival bag for a hypothermia casualty, it should be waterproof and non-breathable. The base fabric could be lightweight nylon or polyester ripstop fabric but it needs a waterproof coating. We suggest making a flat disk 10 feet in diameter. If the fabric is yellow or orange, it will cheer up anybody sitting inside it and you can make it reversible, with a big distress symbol on the other side. See Other Distress Equipment. Make a hem all the way round the circle and insert a draw-cord of thin nylon cord. You can put in a small transparent window made from thin clear PVC or sailmaker's Mylar (polyester film). Use some spare fabric and another draw-cord to make a small stuff-sack to keep it in. For materials, see Retail Outlets. Survival bags and group shelters provide excellent protection against cold winds, but not from conductive heat loss to the ground. In a cool climate this can be significant. For most of the year in temperate climates, you'd get pretty cold if you sat on the ground for two hours. You can keep warm even in winter, even overnight, if you have all three of the following: Good kayaking clothing, a shelter, and a sleeping pad. Our experience is that kayakers seldom carry the latter except when being assessed for leadership or coaching qualifications. However you could roll up a self-inflating pad such as a Thermarest and put it into your kayak through a hatch. Some kayakers don't like the idea of a sleeping pad that may get a puncture so they carry a 4 foot x 2 foot piece of good-quality pad made of closed-cell polyethylene foam. Foam blown with nitrogen is best, and is sold under trade names such as Plastazote, Evazote, Zotefoam or Karrimat. For a cool climate, a suitable thickness is 3/8" (summer) or 5/8" (winter). If your philosophy as leader is Good Shepherd rather than "survival of the fittest" you could take some additional items for the comfort of young or inexperienced kayakers. A small roll of surgical tape makes an instant cure for blistered thumbs. A non-waterproof permeable non-woven synthetic adhesive tape such as Micropore or Fortuna will do the job and can easily be peeled off after the trip. If you are kayaking with young people, take a ball. If the mood of the group needs changing, throwing the ball into the middle will often do it. A great morale booster for younger or weaker members of the group, especially on a cold day, is a vacuum flask of hot chocolate. And a pre-sliced cake also goes down very well. In cool weather, take along a couple of synthetic fleece hats and a pair of kayak mitts to lend to anybody who complains of being cold. And an old waterproof jacket for the young person who takes theirs off for a comfort break and has it blow out to sea. To take with you in the kayak you can make a waterproof extract of the chart, and a note of the times of high tide and slack water. It's useful to note down relevant VHF channels and cellular phone numbers for a friend or two on land, the local Coast Guard, and the harbormaster for any large commercial port you intend to visit or cross. Charge the batteries for your cellular phone and VHF radio. Check whether your own equipment works, that your flares have not passed their expiry date, and that your First Aid and repair kits contain what they say they do (rather than a rusty blob that used to be a packet of needles, a rust-stained triangular bandage, soggy adhesive tape, a tin of congealed polyester resin and an empty Snickers wrapper). Check the weather forecast. Is it going to be too windy for your trip? See Professional Weather Forecasts. Prepare a float plan and leave it with somebody ashore. In some places the Coast Guard likes sea kayak groups to give this sort of document to them direct, and will start a search if the group does not confirm they got back safely. Usually you leave it with a friend, to give to the Coast Guard if you have not called in by a certain time. • whether you are taking flares or a VHF radio. The US Coast Guard has a standard form online at Float Plan Central and Sea Kayaker magazine has one online here. Always make sure you know how many people there are in the group. Nothing sounds worse to the Coast Guard than a leader who is not sure whether his entire group is now safe. It's well worth asking every member of the group to memorize the number so they can each do the occasional head-count at sea. Professional guides make a point of memorizing everybody's names right from the start. Boating books often say "when you arrive, ask fishermen or the Coast Guard for local knowledge". It is sometimes worth having a chat with a local fisherman, especially in a remote part of the world where the pace of life is slow. Elsewhere few fishermen will have any idea about the range or capabilities of a sea kayaker, or care less. Many Coast Guards have no experience of anything under 24,000 tons. If you ask one for a few hints he will have to assume you don't know what you are doing, so his advice will be "wear a lifejacket and stay in the harbor". You may get some useful advice from the lifeboat crew, because they know small boats. Check the weather forecast again and consider whether it corresponds with what you can see, hear and feel on the beach. If it's windy, consider changing the route so that you start off paddling upwind and have an easy ride back in the afternoon. If it's really windy or there's a lot of really dark cloud to windward, change the trip to sheltered waters or cancel it. Do you want to set up an icebreaker activity on the beach? If new members of the group still feel tense and isolated by the time they get onto the water the feeling may last all day. For whitewater trips a good way to break the social ice is to do group practice with throwlines on the river bank, which works because the lines are bound to get tangled up and caught in trees and people are too busy to feel self-conscious. If you can think of a nice icebreaker, go for it. But go easy. Many people seriously dislike being told to participate in a warm-up session of swinging their arms and jumping up and down in the parking lot. It may be better to start a discussion about local wildlife or do a short talk about navigation. If you have children or total beginners in the group, it is probably worth checking that they have adequate flotation for their kayak, an adequate sprayskirt and clothing. If you have a "good shepherd" attitude you could also check that they don't have any non-waterproof objects such as wristwatches, and that if they wear spectacles, they have a retainer cord so they don't lose them if they capsize. If not, maybe they should leave them behind. If an adult wants to go kayaking with inadequate equipment, we tend to feel that's up to him unless he's putting other people at significant risk. But if one of the group is a child who has an unsuitable boat and unsuitable clothing, he will quickly get exhausted and too cold to function. You have to leave him behind. Name two reliable, experienced people as front kayaker and rear kayaker ("tail end Charlie" / "tail gunner" ). The front one's job is to keep no more than 50 yards in front of the rear one, the rear one's job is to stop the group if there's a problem. Tell the inexperienced kayakers they must stay between those two, and to tell the tail end Charlie if they start getting to get cold, tired or flooded. As for the experienced kayakers, ask them if they would please stay with the group except when they are making side trips to explore caves and surf on reefs. And to come back from their side trips every twenty minutes or so. Some situations justify setting up a buddy system, so that each person has a partner and is responsible for calling a halt if the partner capsizes. A leader and assistant should always be aware of powerboats, sailboats or ferry services that may run somebody down; the sea for a mile ahead in case of boomers or surf; the sky for five miles to windward for dark cloud indicating the approach of strong winds or line squalls; any members of the group wandering off; the group's position and in particular the distance from your start point, destination and nearest safe landing place; the likely effect of any local currents; your actual present rate of progress over the ground; and how the time is going. Every ten minutes, count the number of people in the group to make sure you've still got everybody. That may sound like a lot to do instead of enjoying yourself, but it soon becomes second nature so you do it automatically, with no effort at all. If the weather shows signs of changing you may need to change the plan. In an extreme case, you may have to get everybody onto the beach, leave the kayaks there and walk miles back to where you parked. The weather can change quite a lot in an hour, which is worth remembering if you are eating lunch and dozing on some isolated skerry or offshore lighthouse. The leader acts as shepherd, keeping the group together and giving directions if necessary. (S)he should try not to get personally involved in a crisis. If somebody needs to be rescued or towed, ask somebody else to do it. Then (s)he can direct the rescue and keep an eye out for any other problems. The leader's main task is to make sure the front kayakers do not outpace the group. If the stronger kayakers disappear over the horizon it may mean the group should have been divided in two at the outset, but does the slow group still have enough safety kayakers? For group morale, it can be even worse if the strong kayakers repeatedly go ahead of the group, wait impatiently and then speed up again as soon as the others catch up. The hard men get cold while they're waiting and they make slower members of the group feel like dead weight. It can be good for the leader to cruise around the group, spending ten minutes with one person and ten minutes with another. It gives an early warning of problems and makes newer members feel that they are welcome. There's no need to maintain a flow of conversation. Companionable silence is often good. Check that younger kayakers are not getting exhausted or cold. If something goes wrong it is always at the back of the group. It is ESSENTIAL that the rear kayaker can stop the entire group until the problem is sorted out. A good plastic whistle will help. If you like, actively encourage experienced members of the group to talk to new members rather than staying in established cliques. Inclusive, not exclusive. A 10 minute session of walking-round-a-raft or group towing practice may be a good icebreaker without anybody getting too wet. If you have a volunteer casualty you could do a deep-water rescue exercise. Then when you have to do a real one in bad conditions, it is a reassuring routine. Any exercise that involves people getting dunked tends to be a popular suggestion only on a lovely summer's day. But confidence comes from overcoming adversity, and if there's a rescue exercise at any time of year you will often find afterwards that most people say it was the highlight of their day. Is it acceptable to coerce reluctant people into practicing skills at sea? It's every sea kayaker's privilege to be ruggedly independent, or just plain stubborn. It may also be that the reluctant kayaker is unsuitably dressed or finds the proposed practice session quite threatening. Possibly the best solution is to let them sit it out, but tell them that certain trips will not be open to them until they have demonstrated solid rolling and rescue skills at sea. Tell the person holding your float plan that you're back and safe.